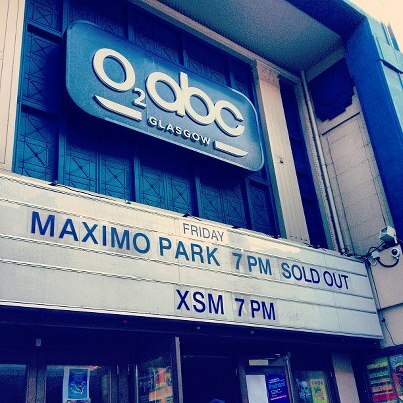 Maximo Park might not be frequenting the charts as much these days, but tonight’s sold out show at the ABC in Glasgow is proof that there is still a large fanbase that will continue to turn up for the frenetic live shows. Maximo Park are a band I’ve always liked and despite their mainstream popularity seemingly dwindling, the release of latest album ‘The National Health’ shows that they haven’t lost their knack for producing high quality punchy pop songs. I love the imagery and memories they evoke through Paul Smith’s infectious lyrics and there’s a lot to relate to in his tales of awkwardness and of times ‘standing in the pouring rain just waiting’. It helps that the band are always good value live, and the excellent ABC was a perfect venue for the band to showcase a mixture of the latest album and a selection of hits and fan favourites alike. The band came on to the stage just after half past eight, beginning the set with the first two tracks off the new album, sombre effort ‘Given to the Wild’ and ‘The National Health’ which acted as a precursor for the energetic set we were about to be treated too. Paul Smith is one of the finest frontman in the business and he was on top form tonight, teasing the audience with his dance moves and shaking his hips to the flirtatious ‘Hips and Lips’. The set lasted around 23 songs with barely a moment to stop for a breath, as Smith and co raced from one energetic number to another. Soon becoming my number one gig ‘pet hate’ is the camera phone and they were there in abundance tonight. The constant requirement for people to video or take pictures during every song is not only a source of annoyance for myself and many others in the audience, but also of complete bafflement. I have no idea why people can’t just enjoy a gig without needing to have a visual memory of every aspect of it. Anyway, I digress! Between songs there was time for Smith to big up Glasgow and to discuss a weird ex-girlfriend from his teenage years, with a habit of writing everything about him in her diary “at least we got a song out of it” after set highlight “Write This Down”. Whilst the set was heavy on tracks from their latest album, there was a lot of love for their debut ‘A Certain Trigger’ as well, with rare outings for tracks such as ‘Kiss You Better’ as well as hits like ‘Graffiti’ and ‘Going Missing’. A small fight broke out between two fuds at the front during ‘Books from Boxes’ which threatened to spoil the good atmosphere, but the quick reaction of the stewards sorted that one out! Ironically for a band I wouldn’t associate with such behaviour, I remember a fight at one of their gigs at the Barrowlands a few years ago- must be something in the water! The main set finished with a riotous version of ‘Apply Some Pressure’ before the encore began with one of my favourite Maximo Park songs, ‘Acrobat’, a track I’d been lucky to hear once before and I certainly felt lucky to hear again tonight. ‘Our Velocity’ finished off a terrific evening as Smith got the whole crowd wound up dancing and singing before disappearing into the night, until the next time. So a fight, plenty of drink and some great music- just a standard night in Glasgow I suppose! *My dislike for writing down the setlist during the gig (and the lack of a setlist.fm contribution) means there is a little bit of guesswork around the order, but the songs should be correct.